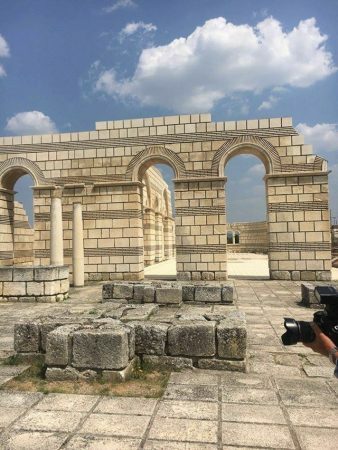 Bulgarian Prime Minister Boiko Borissov has promised that his government will provide further funds for the restoration of the Great Basilica in Pliska, the ninth-century church built by Bulgarian ruler Prince Boris at the time that the north-eastern city was Bulgaria’s capital. Borissov’s promise, made during an inspection of work on the Great Basilica, came a few weeks after Roman Catholic Church head Pope Francis donated 5000 euro towards the restoration of the Great Basilica, which in turn was followed by a gift of more than 2500 euro from Bulgarian boxer Kubrat Pulev. Pliska was the capital of the First Bulgarian Empire between 681 and 893 CE. The architectural complex includes a cathedral, an archbishop’s palace and a monastery. Completed around 875, the basilica was the largest Christian cathedral in Europe, with an area of 2920 sq m.
Borissov said that Pliska was not just a historical site, but differed from all others, in its importance to Christianity and literature. Every child should be brought by their teachers to Pliska because it was a symbol of Bulgarian literature and Christianity, he said. He said that the number of tourists who visited Pliska in 2015 added up to an increase of 25 000, and he confidence that with the completion of the restoration project, which began last year, that number would increase further.